Robert M. Hannemann, 72, died of liver cancer on December 18, 2017, at Sun Terrace in Sun City Center. He was born in Oklahoma City, grew up in Indianapolis, and spent most of his life in Florida. He was a graduate of Indiana University. He was a disabled veteran who serve in the U.S. Navy from 1975 to 1989 as a shopkeeper. He was stationed aboard ships, and also in Antarctica and the Philippines. He was a jack of all trades, master of none: everything from substitute teacher, courier to pizza delivery man. His passion for music, especially Bluegrass music, was all encompassing. He loved the Beanblossom Music Park in Brown County, Indiana. His knowledge of history and his memory for dates and numbers was phenomenal. He reached out often to family and friends. Robert never met a stranger! He was preceded in death by his brother Steven Hannemann, his father and mother, Earl and Elsie Hannemann, and his beloved wife Judith Speiser Hannemann. He and Judy moved to Rincon, Georgia, to be near her daughter and son-in-law, Kristy and Darrin Morehouse. After Judy’s death on October 11, 2017, he moved in with his sister Susan Stanis in Sun City Center. He is survived by sisters Susan Stanis and Kathy (Robert) Bizzano; nephews David Smith, George (Pamela) Smith and Jeremy Bizzano; and grandnephew Steven Smith as well as his step-daughter Kristy (Darrin) Morehouse; step-son Ron (Susan) Speiser; beloved granddaughters Meghan and Ashlee and a great-granddaughter. Our family is small, now smaller, but the love is huge and enduring! The family will hold a private memorial. Arrangements by Zipperer’s Funeral Home. Bev Johnson, 82, died Thursday, December 14, 2017, after a brief illness. Beverly will be lovingly remembered by her two children, James and Kathryn; her granddaughter Ali; her daughter-in-law Denise Johnson; and her beloved dog Heidi; as well as many of her friends and neighbors in the Sun City community. Bev lived for the simple things in life, and was known for her friendship, her quick wit, her love of animals and gardening, the many hours she spent volunteering, and friends she made while out and about. She was a lifelong Lutheran, whose favorite accomplishment was serving as the first woman Elder at St. Paul’s Lutheran Church in Connecticut. Born and raised in Niagara Falls, where she attended Niagara University, Beverly will be joining William Johnson, her beloved husband of 34 years, as well as her brother Roland, mother Grace, and her father Lawrence Shafer in His Everlasting Embrace. Date for commemorative service will be announced shortly. Instead of flowers, please consider making a gift to the Society for the Prevention of Cruelty to Animals. 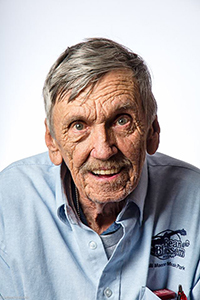 Charles William Winston, age 79, passed away December 16, at his home in Riverview, Florida. He was born in Roxbury, Massachusetts, served four years in the United States Air Force, recently retiring after several years of service with Publix Super Market. Charles was one of three children born to Blanch and William. His sister Blanch passed away in 2009. His brother John lives in Fairmont West Virginia. Charles is survived by his wife Fran; his brother John; daughter Karen Teter; three sons, Kevin, Charlie and Brian; 11 grandchildren and three great-grandchildren.